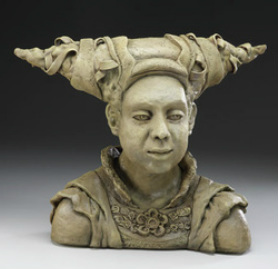 to see one-of-a-kind, hand-built figurative ceramic sculpture. How often in life have we decided whether to "sing with the choir" or step aside and find our own path? Dreaming and meditation, memory and nostalgia...the ironies of aging or portrayals of hopeful anticipation of the journey ahead. Conversations with an artist from the past, perhaps from the European Classical or Renaissance periods, and more often from early Modernism.